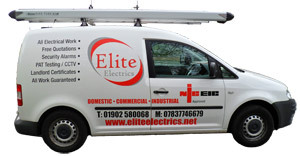 Elite Electrics Midland Ltd established in 2003. With a combined 20 years wealth of experience we are able to offer a complete ‘one-stop’ shop for all electrical system requirements. We have a well-earned reputation and are trusted to deliver on time and to budget; we pride ourselves on a high standard of workmanship and a friendly flexible approach with competitive pricing. We are committed to high standards of customer service and we have 100′s of satisfied customers. Our company aim is to provide a comprehensive service for reactive and planned maintenance work. Our processes and procedures are continually monitored and reviewed to ensure the highest quality of service delivering a, fast and effective package. Our operations centre is staffed 24 hours a day, 365 days a year, so our customers are always able to speak to a trained operator and never receive an automated response. Our teams work closely together to ensure that the customer receives a straightforward, co-ordinated and efficient service. At the time of booking our experienced staff will select a local engineer to attend the site. The progress of the job is then carefully monitored through to completion. Regular updates on job progress and arrival times are relayed directly to the customer. Our modern fleet of vehicles are equipped with the most popular and commonly used products in repair and maintenance work, so that wherever possible the job can be completed on the first visit to the property. Our work is approved by a number of County Councils and some of our more regular customers include a facilities management companies, as well as many of the well-known high street retailers. We currently respond many emergency call-out situations every day, often dealing with the work in very tight timescales, in fact a high proportion of our emergency work is booked in and completed within a 2 hour window. We aim to be the number one choice for emergency work and the preferred choice for planned maintenance providing a fast, effective high quality service that fully understands the needs of our customers and provide customer satisfaction on all jobs.